What: Discovers her husband has left roses all around their hotel room. Why: It's their anniversary and he wanted to make it special. How did it go: They danced in their hotel room. She emerged from the bathroom, sliding her earring through the hole in her left ear with one hand and putting the backing on with the other. She had slipped on the long-sleeved red dress with the low-cut neck she had bought just for their anniversary dinner, and carefully curled her hair the way her husband liked. It had taken her longer than she expected to finish getting dressed, but she had been pleased with the results when she finally drew back to look at herself in the mirror. "Honey, we need to go or we'll be late for our--" she broke off, stumbling over her own feet as she stared at the room. The lights in the spacious suite had been dimmed, the darkness from the window highlighted by the twinkling gold lights decorating the surroundings buildings. Around the room were dozens of red roses, red petals scattered along the floor and the furniture. She gazed around the room in disbelief, breathless at the beauty staring at her. From the open French doors joining the living room to the bedroom, her husband emerged, looking elegant and stunning in a classic black tuxedo. 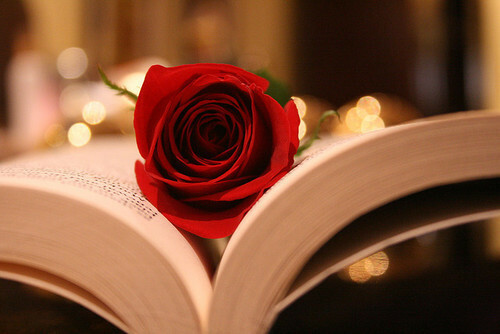 He held a single, long-stemmed red rose in his hand, a small smile on his face. "What...?" was all she could choke out. He approached, his black patent shoes clicking on the tiled floor. "We've been married for ten years," he began, his face so full of love she couldn't even miss it. "And in those ten years, I've never done anything romantic for you, even though I know you've always wanted me to." He finally stood before her, holding out the rose. "So this year, I vow to make every anniversary after this special and romantic." She numbly took the rose, feeling tears spring to her eyes. "Why this year?" she managed to ask. "Why is this year so special?" He gave her a gentle smile, tinged with sadness. "Every year has been special," he told her softly, the back of his fingers caressing her cheek. "This is just the first year I've been able to plan something I thought worthy of you." She threw her arms around him, hugging him fiercely. "It's beautiful," she whispered. "I love you." His hands lightly wrapped around her waist, then lifted her right hand from his neck. She pulled back, frowning curiously. He suddenly spun her out of his embrace, a romantic, lovely violin sound filling the room. She gasped, searching for the sound. He snapped her back into his arms, holding her right hand in his, spinning her to the melody. Her eyes fell over his shoulder, where three musicians stood in the corner in black tuxedos, two with violins, one with a bass. She looked up at her husband, wide-eyed, trying to hold back her tears. "I love you," he said, giving her a little twirl. "I've loved you for the last ten years, and after tonight, I'm going to love you for ten more. And then another ten more. Until I've spent my whole life in love with you." She felt a tear trickle down her carefully made-up face and nodded. "I'll look forward to it," she whispered.